OK, today no rant, just one more little insight to offer from Super Bowl ads. I'm able to track click-throughs to each link I share in these emails. I thought you might be interested to see a graph of these clicks from yesterday. Note they're shown as an index, not actual numbers, with a starting index value of 100 for Sunsilk. 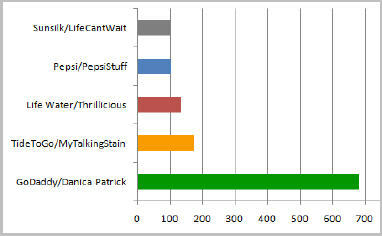 As you can see, VideoNuze email recipients expressed a pretty strong interest in the GoDaddy.com Danica Patrick ad. I'm sure many of you are not surprised since it has a pretty overt potential payoff for visitors. To make this more tangible, consider this: The SoBe LifeWater ad was easily the most impressive use of special effects of all the Super Bowl ads. No doubt the SoBe LifeWater folks spent heavily making the ad, and then paying supermodel Naomi Campbell to dance with the pack of lizards to Michael Jackson's "Thriller." It certainly qualifies as the kind of thing that people would be interested in seeing more of, had SoBe LifeWater teased fans the right way at the end of the ad. The point is this: I think SoBe LifeWater missed a huge opportunity to keep viewers engaged, which would have both improved the ROI on their Super Bowl ad spend, and also deepened viewers' engagement with the brand. While the Campbell spot was hugely entertaining, it did little to power ongoing engagement. Contrast this with GoDaddy, which no doubt had people pouring into its web site since the spot ran, with ongoing chatter and brand-building taking place. As I said yesterday, advertisers need to understand how to use broadband video to evolve Super Bowl ads from having big-time entertainment value to having big-time engagement value. 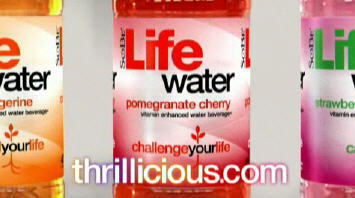 Some like GoDaddy get this, while many others, like SoBe LifeWater, are still on the learning curve. Addendum - I missed this piece in AdAge "GoDaddy Super Bowl Spot Sets Web-Traffic Record." The "Exposure" on-air ad drove 2 million visits to the site, during the game alone, a record for GoDaddy since it began advertising on the Super Bowl. And no doubt a multiple of that since the game ended. More evidence that GoDaddy nailed it big-time.